The 2015 Automate tradeshow brought together the latest and greatest in robotics and automation technology from around the world. With recent advances in robotics, this year was an especially exciting year to take part in the trade show. It was evident from the small and large tech companies that promising growth prospects are almost entirely due to advanced and innovated technological developments; opening new doors to completely new applications for robots. These advances have already and will continue to contribute to the growth of industries ranging from manufacturing, food and beverage, chemical, rubber and plastics, electrical/electronic, and automotive industries to medical, entertainment, agricultural industries, and more. From large companies to start-ups, the biggest drivers are leaps in precision sensors, embedded control, intelligent software, advanced end-effector technology, and human-robot interaction. Personally, I found robots designed for close interaction with humans - dubbed “collaborative robots”- the most exciting robotic trend. With a five session track on Collaborative Robots at this years’ show, it’s perhaps one of the hottest topics of the industry today. With the shift from man-made to machine made products that was ignited in the mid-18th century, a new era of human experience began where increased productivity created a much higher standard of living that had ever been known in the pre-industrial world. In the 21st century, our industries are evolving to be smarter, safer and more efficient. The signs of yet another era of human experience are already visible; smartphones, smart appliances, automated processes, the internet of things, etc. We are living in exciting times. Our society’s technological progresses are giving us the most valuable “thing” of all: time. Time to be more productive, time to be more creative, time to be more imaginative. The era of “traditional” robots operating in caged areas is by no means nearing an end as evident by their strong, dominant presence in Automate/ProMat 2015. Where these robots have some flexibility, they are in no way comparable to the flexibility of manual work. The natural development of robot technology is going from a repetitive performance and function to full mobility and flexibility in the future where robots are fully adaptable to humans and changing environments. The potential is to take away boring work from manual labor and instead allowing manual labor to spend time on craftsmanship, customization, and adding value, uniqueness and passion to small batch sizes or large product variety. Instead of replacing people, collaborative robots work with us as intelligent tools; a new breed of robots, evolved from dangerous machines to assistants in a shared workspace. This opens advantageous doors for small businesses to gain a unique edge in today’s increasingly competitive global market. Automate 2015 gave me the rare opportunity to personally interact with several of these robots and witness the wide range of their applications. Universal Robotics irrefutably had an enormous presence in McCormick Place this year. The UR robot arms were diligently working in other Automate and ProMat show locations in applications ranging from Pacline’s (www.pacline.com) overhead conveyor picking to pick and place tasks equipped with the Robotiq’s (www.robotiq.com) adaptive 3-finger gripper, to vision guided brain surgery at the MDA (www.mdacorporation.com) booth, and many more. Universal Robotics was founded on the idea of reinventing the industrial robot, and all of their products are designed to work without cages. The company continues to expand the range of applications and businesses that can benefit from their technology by unveiling the latest and smallest addition to their long line of successful collaborative robot family; the UR3. Claiming to be the world’s most flexible, lightweight table-top robot to work alongside humans, it has a payload of 6.6lbs while weighing a mere 24.3lbs, with 360 degree rotation on all wrist joints and infinite rotation on the end joint. The tabletop robot allows for the automation of new ideas where human and robot work on the same table to increase efficiency and safety of the manufacturing task, while keeping knowledge on the factory floor. It’s the perfect tool for small format precision tasks. The robot’s soft, padded dual arms in combination with ABB’s innovative force-sensing technology ensures the safety of YuMi’s human-coworkers. What sets YuMi apart is its precision and accuracy in handling delicate and precise parts. A skill that is required in manufacturing products ranging from watches to mobile phones and beyond. KUKA Robotics (www.kuka.com) rank among the world’s leading suppliers of industrial robots utilized in a diverse range of industries from automotive and aerospace to service and medical robotics. Automate 2015 was the debut for KUKA Robotics series-produced sensitive collaborative robot: LBR iiwa. “LBR” stands for “Leichtbauroboter” (German for lightweight robot), “iiwa” for “intelligent industrial work assistant”. With seven axes, it has a redundant joint which allows the arm to reach for a specific part with more than one orientation; avoiding collision with a human operator while still continuing with its task. They respond to the slightest of external forces to enable collision prevention. During assembly, unlike with position-controlled robots, the arm can locate, correctly pick up, and precisely join parts even if the parts have not been accurately fed into the magazine. From what I saw at the tradeshow, several features were common among these arms that have enabled this new era of human-robot collaboration. These features are the keys that have rendered these robots perfect for precise, high speed and high accuracy tasks where people and robots work side-by-side. Cost reduction and increased safety are necessary for incorporating robots into more manufacturing floors. On one hand, current advances have driven the cost of hardware and software down. On the other hand, incorporating safety measure inherently within the robot eliminates the need for and consequently the cost of fenced-off areas. As such, the additional costs associated with safety equipment, external circuitry, and space requirements are avoided with these robotic arms. The force-sensing in the UR3 has increased safety and flexibility. It can be set to stop immediately when it encounters forces as low as 50 N. Similarly, ABB’s Integrated Power and Force Limiting technology enables safe interaction with the robot. The small YuMi arm is constructed of a skeleton, small motors, and padding covered by a floating shell. When you collide with the robot, the force is absorbed in the padding. The momentum is also small due to the velocity controls, ensuring no harm to the operator. The LBR iiwa has been equipped with integrated torque sensors. Similar to YuMi, in the case of unexpected contact, LBR iiwa reduces its velocity in an instant, and thereby limiting its kinetic energy and momentum to a level that prevents injuries. These days, the mechanics of robots have become simpler, and technology is put into getting higher accuracy using sensors and embedded control. Sensors are becoming a product that can be used in robots at a low cost. They not only increase the safety and accuracy of robots, but give them intelligence and awareness of the surrounding dynamic environment. An important feature for integrating robotics into a wider range of industries is making robots simple and flexible to use. The light weight of these robots makes it possible to move them from station to station. Each of the LBR iiwa, UR3, and YuMi arms have incorporated a form of intuitive and easy to learn programming strategy. The operator can easily and quickly teach the LBR iiwa by demonstration and guiding the arm to the desired position. LBR iiwa stores the coordinates without the operator requiring any programming knowledge. The UR3 can be controlled using the company’s intuitive graphical user interface. For me, the most exciting is the ability to use native interfacing capabilities. This allows for simple integration with in-house software and eliminating the need for proprietary software. Visitors to the booth were welcome to experience for themselves how easy it was to learn how to control the arm. Collaborative robots minimize costs for manufacturers, which for the first time makes investing in robots profitable solutions for smaller businesses with faster payback. Even more exciting is the opportunities available for new business ventures not possible previously. In the final session titled “Collaborative Robots: Where We’re Headed” of the five session track on “Collaborative Robots”, Esben Ostergaard, the CTO of Universal Robots showed how their robot arms opened the door for personalized, perfect footprint flip-flops made right in front of your eyes. Without the UR3 arm, the Yooshu business venture would not be profitable or even conceivable. LBR iiwa, UR3, YuMi, and other such collaborative robots open up entirely new automation solutions that were previously not possible due to safety requirements and costs. Now humans and robots can share the same workspace and divide tasks optimally. Not only are these robot assistants safe to be around and work with, they take harm away from human operators by being responsible for dangerous tasks (using sharp machining tools, etc.). Furthermore, they increase product quality and uniformity with the machine’s ability for precision. 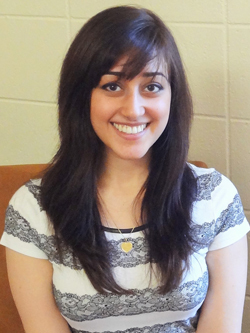 Mahdieh Nejati is a Master of Science in Robotics student at Northwestern University in Chicago, Illinois. Prior to her graduate studies, she completed her undergraduate in Mechantronics Engineering at the University of Auckland, New Zealand. Her areas of research interest include assistive robots, medical and rehabilitative devices, standardized educational platforms, machine learning, and novel sensing and control strategies. She dreams of developing new products and technologies beneficiating consumers and businesses on a global scale. While in New Zealand, Mahdieh worked at the Biomimetics Lab (http://www.abi.auckland.ac.nz/en/about/our-research/biomimetics.html) at the Auckland Bioengineering Institute where she investigated the principles of aquatic locomotion and sensory feedback in animals. She then worked at StretchSense Ltd. where she integrated silicone sensing into conductive fabric (www.stretchsense.com). This expanded the startup’s product line to wearable applications in the sports industry and assistive devices. Longing to learn more about the world, she traveled to 15 countries before heading for the United States as part of the International Exchange Program (IEP) of North America. She is very excited to begin her internship at Applied Dexterity (applieddexterity.com), an innovative surgical robotics company located in Seattle, Washington, this summer.